"Screen Directors Playhouse: Dark Mirror"
When we think of twins in real life or imagination usually conjures a handsome young couple pushing a double pram with a pair of identically dressed and featured tikes. At first glance, we may be envious of the young mother who gets to raise this double-dose of cuteness but soon we realize that all the troubles of childrearing will be more than doubled for the hapless dad. The evil twin is a literary device used to create an especially frightening antagonist through many genres. Often, the good and evil characters are separated at an early age, although a common device is for the evil sibling to have tormented the good for years while growing up. 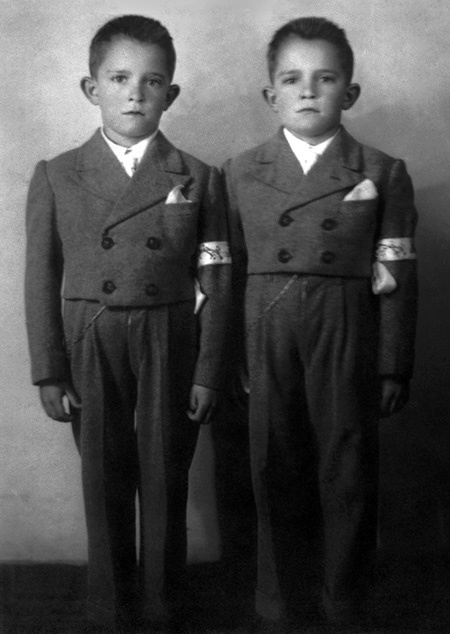 When the good twin becomes a companion to the story's protagonist, the existence of the evil twin will be unknown and leads to all sorts of confusion which will be blamed on the good twin. In cinematic melodrama creating an evil twin is easily accomplished in the makeup chair by adding a scar or goatee to the actor playing both parts, although there have been instances of actors having an actual twin and the siblings taking the different roles. It is difficult to hear a scar, of course, but radio actors have had a lot more practice in doubling than screen actors. 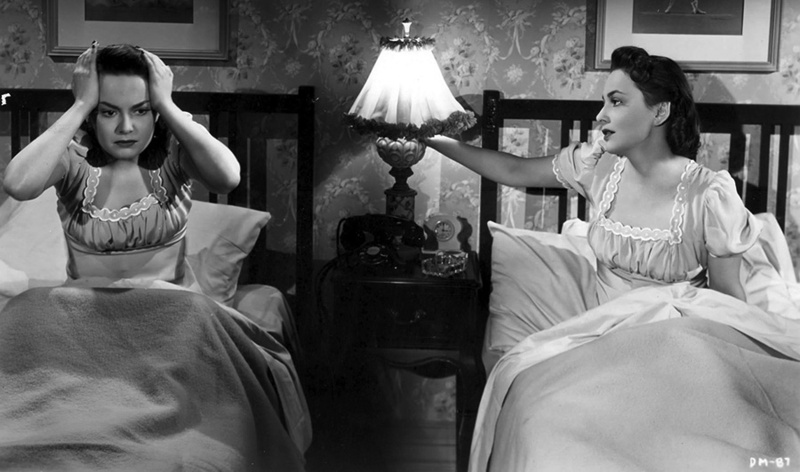 One of the most chilling uses of the evil twin concept was in the psychological thriller "The Dark Mirror" starring Olivia de Havilland and adapted for Screen Directors Playhouse in 1950. Method actress de Havilland (who insisted that everyone in the cast seek treatment from a professional psychiatrist before filming began) plays a pair of identical twins who are so similar in appearance that they can share the same job and social appearances without anyone noticing. However, one twin is a homicidal maniac and the other her unwitting iron-clad alibi, or is she really so unwitting? Dorothy Lamour has a run in with Sydney Greenstreet's supposed insane twin on Sealtest Variety Theatre when she is looking for an out-of-town place to rent, the bit does a great job of letting Greenstreet spoof his on-screen persona. Bette Davis plays a twin who murders her sister and assumes her identity on Lux Radio Theatre's adaptation of "Stolen Life". 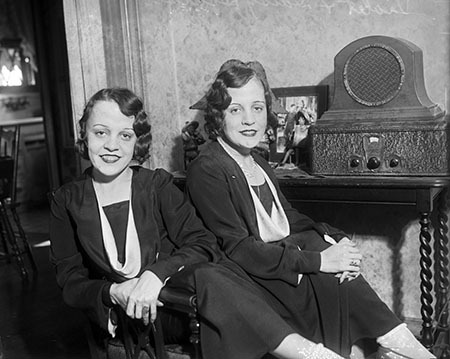 Twins and evil twins are creepy enough to be natural for "Radio's Outstanding Theater of Thrills". Suspense gives us "The Pasteboard Box" where a twin murders his brother and chops up the body but faces difficulty disposing of the head, and "Five Buck Tip" where a convicted murderer nearly gets away with having his twin take his place on the electric chair. A very interesting use of twins is in "The Big Gamble" on The Whistler when a racehorse produces twin foals and the bad guys train one to be a sure winner and the other to lose every race he runs. The program also gives us "Death Sees Double", another tale of a murderous twin taking her sibling's identity, this time discovering some uncomfortable secrets about her late sister. Be the first to comment on "Doppelgangers and Evil Twins"